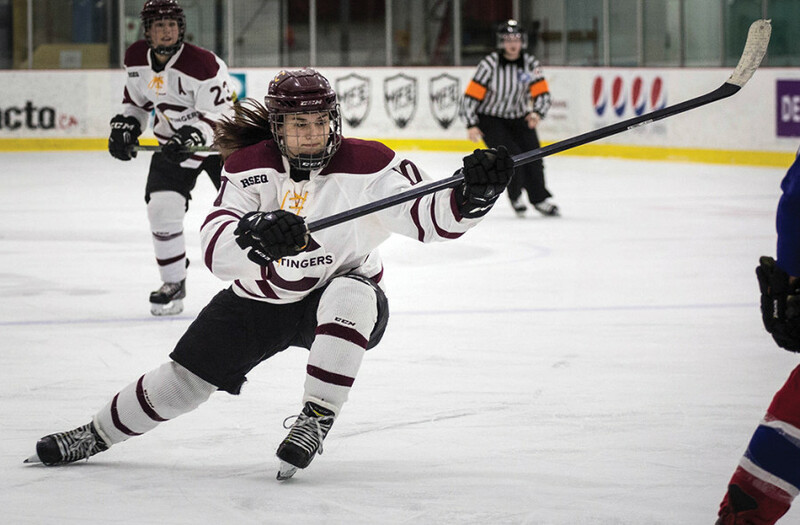 Forward Sophie Gagnon scored the game-winning goal midway through the third period to lead the Concordia Stingers women’s hockey team to a hard-fought 3-1 win over the McGill Martlets Saturday afternoon at Ed Meagher Arena. Gagnon cut towards the front of the net and beat Martlets netminder Rachelle Champion cleanly at 10:13 towards the end of the game. The goal completed the comeback for the Stingers, who found themselves trailing 1-0 at the second intermission. The Stingers began the rally when Stephanie Lalancette took an innocent-looking shot from just outside the left faceoff circle. Her drive on goal found its way through, giving the forward her fourth goal of the season for Concordia. Keriann Schofield completed the scoring into an empty-net with only ten seconds left on the clock. The game began rather ominously for both sides. Martlets starter Tricia Deguire was forced to leave the game after suffering an injury just over seven minutes into the opening period. Deguire laid motionless on the ice for a long stretch as both McGill and Concordia training staffs tended to her. She would ultimately leave on a stretcher, bound for the hospital. How Deguire exactly got injured was rather unclear. The incident occurred after Stingers forward Claudia Dubois broke in alone on the McGill goaltender. Deguire made the save, but would soon fall to the ice. Champion, who replaced the injured Deguire, was seeing her first game action of the season. This did not affect the Stingers’ game plan, according to Chu. Emphasis remained on getting pucks and bodies towards the opposing net. Martlets captain Melodie Daoust opened the scoring for McGill just before the second period came to a close. She weaved her way to the middle of the ice, before beating Stingers keeper Katherine Purchase. The Stingers goalie would finish with 18 saves in the winning effort. The win marked the first victory of the season for the Stingers in four tries against their crosstown rivals. While much positives could be taken from each of the three previous meetings, it was nice to finally be on the winning side of things, said Chu. What made the win all the more special for Stingers players was that it coincided with the team’s “Shoot for the Cure” night in support of breast cancer awareness. The rink was decorated in pink for the event and Stingers players had pink tape on their respective sticks. Special baked goods were prepared by a handful of Stingers players and a silent auction for Stingers memorabilia took place with profits going to the cause. The Stingers are back in action next Saturday in Ottawa against the Gee Gees with the puck drop set for 2:00 p.m.